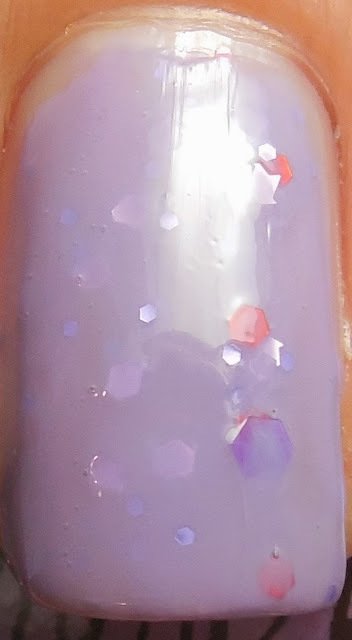 I'm always interested in trying a new brand, especially one from overseas, so I'm especially excited for today's polish which is Femme Fatale's Miasma. Femme Fatale is an Australian indie known for beautiful glitter polishes, and this one is no different. Miasma is a grey leaning muted purple crelly that leans more cream, with light pink and fuchsia hex glitters and large black circle glitters. The polish was thick and the glitters were sparse during application but I managed to apply three coats without too much difficulty. There was some awkward random placement of the glitters here and there and I ended up with some slight clumping of glitter. The colored base is too opaque to allow the glitters to show through, and all you can see are the upmost layer of glitters. Bummer! This is all finished with a layer of topcoat. The smokey purple base makes this a lovely everyday neutral while the glitters give it an updated pop of color. This would be great to wear when you need a polish that can go from work to an evening out. Despite the less than perfect formula, this won't deter me from trying more drool worthy polishes from Femme Fatale. If you're interested, don't despair if you think this line is difficult to obtain, fortunately you can pick this line up at most of the international stockists, such as Harlow & Co where I picked up mine(free shipping over $50, make you holla!). Have you tried any international polishes lately? Do you have any favorites?